It turns out the Nissan Leaf has features that will impress more than just the environmentally-conscious drivers — it has something for video game lovers too. The car comes complete with a video game-like efficiency tracker called CARWINGS, which is displayed on the Leaf’s 7″ LCD screen. 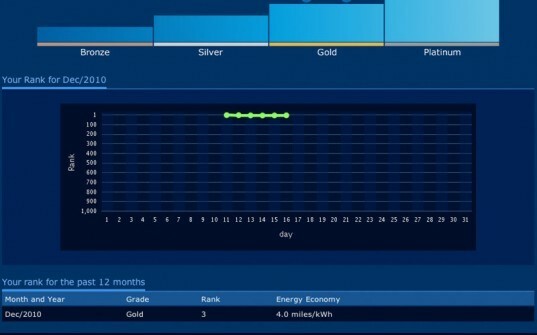 The system shows distance traveled and energy consumed in daily, monthly and annual reports and then pits your stats against all other Leaf vehicles on the road. In CARWINGS, you and every other Leaf driver are in competition to win the coveted platinum Leaf cup. Start your electric engines! This feature has been available in Nissan models in Japan for years, but the electric vehicle is set to bring the system stateside. In addition to displaying CARWINGS stats, the LCD screen shows you your current position on a map, your possible driving range, and all charging stations in the area that you could reach if needed. With all of these neat visual features and the added efficiency game, it seems this little screen could get a bit distracting. Although we’re a bit worried about the Leaf’s nifty screen running game-hungry drivers off the road, it is a great way to keep Leaf owners on the high-efficiency track. Even though the Leaf is an all-electric driving machine there are still ways to make it more efficient — like removing heavy loads and limiting aggressive driving. CARWINGS can help drivers keep the Leaf charged and on track for that platinum cup. So if you’re a game fanatic and you’re into electric rides, this is just one more reason to head to a Nissan dealer in the new year. 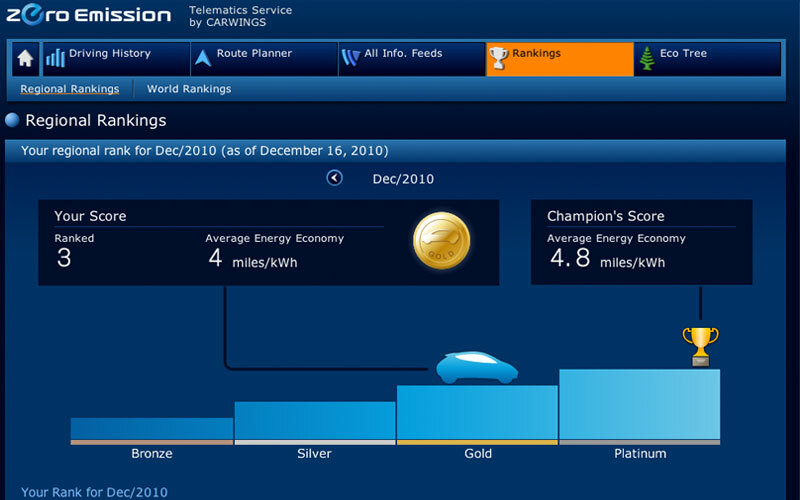 Nissan Leaf Comes with Efficiency Driving Game: How Do You Compare? It turns out the Nissan Leaf has features that will impress more than just the environmentally-conscious drivers -- it has something for video game lovers too. The car comes complete with a video game-like efficiency tracker called CARWINGS, which is displayed on the Leaf's 7" LCD screen. The system shows distance traveled and energy consumed in daily, monthly and annual reports and then pits your stats against all other Leaf vehicles on the road. In CARWINGS, you and every other Leaf driver are in competition to win the coveted platinum Leaf cup. Start your electric engines!